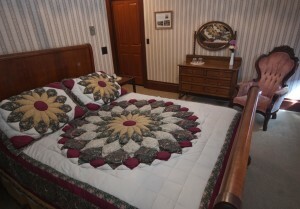 The Queen size sleigh bed and puff quilt in this room overlooks the Wildcat Mountain from two windows. Shades of tan and maroon offer a “Western” Victorian atmosphere with an armoire and mirrored dresser. 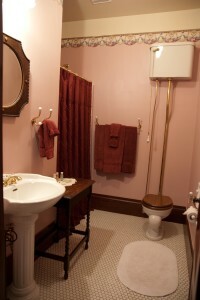 This private bath offers a shower and unique pull chain water closet.